Thomas Betts was born in Beachampton in 1860. He began working as a builder in Stony Stratford and established his own company in 1881, when he had over 100 men working for him. 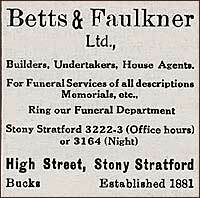 Many of Stony’s historic buildings still stand today thanks to the work of Betts and his men.